The Wilkes-Barre/Scranton Penguins kicked off their 15th season in style by getting off to one of the best starts in franchise history. Although the month wasn’t entirely perfect, the team rattled off six wins in a row before faltering to close things out. Read on for a recap of the Pens’ first month of the 2013-14 campaign, which will highlight the players who stood out and the best team performances. Forward Brian Gibbons leads the Penguins in goals (five), assists (nine) and points (14), as well as plus/minus rating (plus-11). Jeff Deslauriers has emerged as the team’s top goaltender, going 5-0-1 in October with a .901 save percentage and 2.47 GAA. Team captain Tom Kostopoulos will make his return to the lineup after dealing with a lower-body injury. No other Penguins are injured at this time. Chris Conner and Harry Zolnierczyk had brief call-ups to Pittsburgh. They didn’t get on the score sheet, but Conner averaged 10 minutes of ice time over two games, while Zolnierczyk played in three contests and had about nine minutes of playing time. Jayson Megna was recalled to Pittsburgh on October 24 with Beau Bennett being placed on injured reserve. Goaltender Eric Hartzell has been assigned to the Wheeling Nailers of the ECHL. Hartzell has not gotten any playing time with veterans Deslauriers and Peter Mannino splitting the load in goal. The Penguins came out of the gates flying, posting a 5-2 victory over Bridgeport after being down 2-1 in the second period. Harry Zolnierczyk and Chris Conner each had two goals in the win, while Brian Gibbons had two assists. Jeff Deslauriers picked up his first victory in his Penguins return with 22 saves. On October 25, the Pens fell behind to the Binghamton Senators early but could not come back from behind and lost 4-3 in the shootout. WBS didn’t score on any of its four shootout attempts. There is a tie for this month’s award between forwards Jayson Megna and Brian Gibbons. The dynamic duo teamed up early on in the schedule to become the team’s top scorers. Gibbons is well on his way to a breakout campaign with 14 points to date. Megna, meanwhile, earned his first NHL call-up after posting five points in the Pens’ first six games. 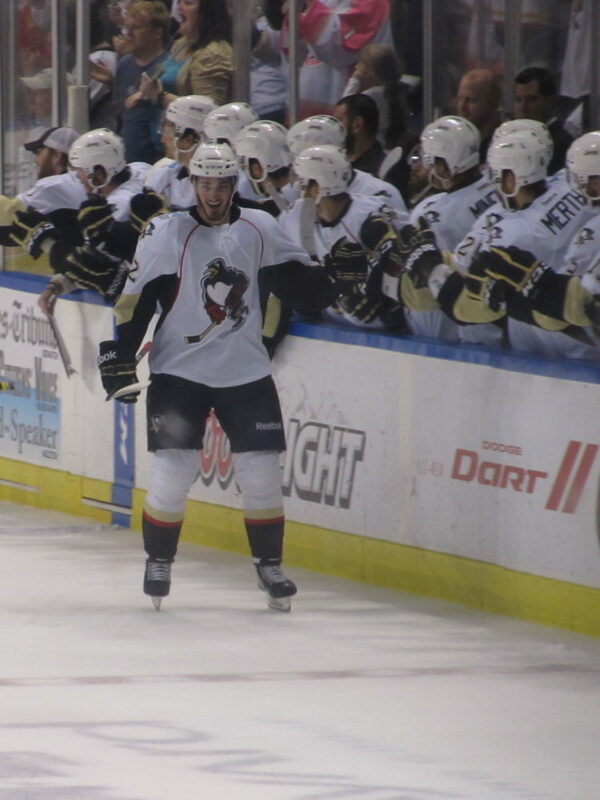 In the Pittsburgh Penguins’ October 28 game with the Carolina Hurricanes, he got his first two AHL points. The first came on an assist on a Tanner Glass goal, and the other was his first NHL goal in the third period. He was assisted by Sidney Crosby and Brooks Orpik. 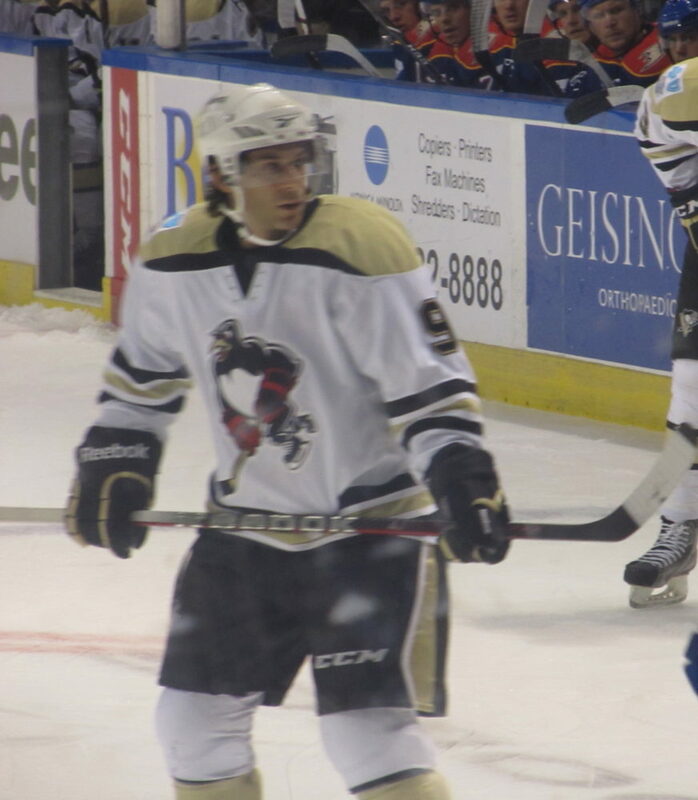 Penguins newcomer Mike Carman spent the 2011-12 and 2012-13 seasons in Hershey, posting 22 points in 94 regular-season games. He currently has three assists in two games with Wilkes-Barre/Scranton. The Pens will get another look at last season’s team captain, Joey Mormina, who signed with the Crunch in the offseason. Mormina has one assist and 12 penalty minutes through seven games with his new team.